Birds have been sharing the skies with airplanes for more than 100 years, but that doesn’t make them good travel companions: Their close proximity to aircraft can lead to deadly encounters for both man and fowl. Recognizing the need to avoid such devastating collisions, researchers at the U.S. Department of Energy’s Argonne National Laboratory have sought solutions for protecting at-risk species while ensuring the safety of departing missions at the U.S. Air Force’s Kunsan Air Base in Gunsan, South Korea. 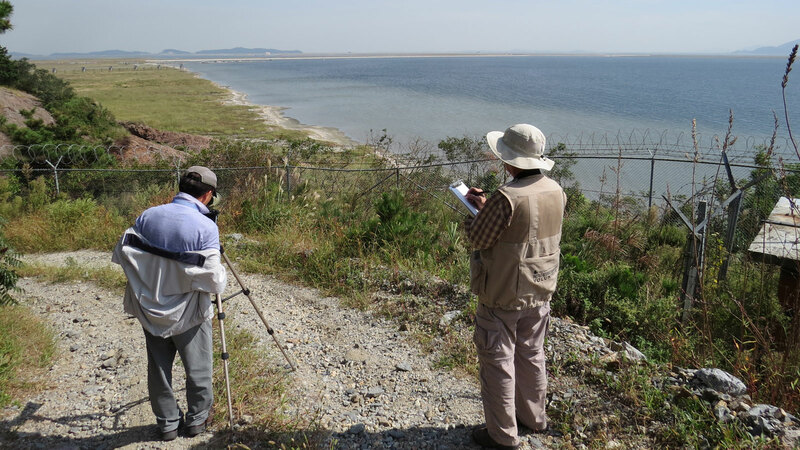 Researchers from Argonne’s Environmental Science (EVS) division have participated in an ongoing project focused on protected species at Kunsan Air Base since 1999, barring a six-year hiatus between 2008 and 2014. Researchers conduct annual surveys for species at the base, identifying those that require full-time management plans and those making a temporary stay on site. With heightened wildlife traffic on a functional air force base comes increased risk of wildlife mortality and interruption of flights or worse. Particular concern has arisen for birds that often reside near the runway, boosting the chance of run-ins with aircraft. Despite these perils, Kunsan has become an unlikely refuge for many species adorning South Korean protection lists. Caught in a federally regulated Catch-22, air bases must recognize and protect the country’s endangered and natural monument species while ensuring that air missions remain a top priority. EVS researchers have developed successful methods of grounds monitoring, which require two or three visits to the site per year. During these visits, they walk targeted habitats at different seasons to account for different migration and breeding periods. “The process may sound a bit old-fashioned, but over the course of a week-long survey we see several thousand birds, among them 40-60 different species,” said Kirk LaGory, an ecologist in Argonne’s EVS division. Examples of such protective measures are those in place for the Eurasian Kestrel (Falco tinnunculus) and the Eurasian Hobby (Falco subbuteo), both natural monument species recognized for their presence in South Korean cultural heritage. While the base may discourage or preclude nesting by these birds, they cannot disturb existing nests until the young have fledged. Base staff are instructed to survey runways and sound air cannons before training flights take off to scare birds from the runway and minimize threats of bird–plane collisions. Grassy areas around the airfield remain cut to curb rodent and insect populations, the birds’ primary food sources. All trees scheduled for trimming or removal activities must first be inspected. If an active nest is found, the tree remains undisturbed. In their most recent visits this year, EVS researchers reconfirmed the presence of multiple species that had not been observed on site since 2002. Among them are an owl, the Northern Boobook (Ninox japonica), and the Seoul Frog (Pelophylax chosenicus). The researchers witnessed two adult Boobooks and their fledgling, confirming that this natural monument species breeds on air base grounds and requires management plan protection. Use of biocides and changes in habitat around the base raised concerns over the Seoul frogs, which went unaccounted over several years of surveying. But in 2017 and 2018, EVS staff located several small populations in drainage ways throughout the base. Upcoming surveys will continue to assess bird and amphibian populations, while also taking a closer look at invertebrate species and confirming whether the protected Leopard Cat (Prionailurus bengalensis) lives on base. Next year, EVS researchers will also begin conducting vegetation surveys at the base due to the emergence of several invasive plant species and diseases threatening the ecosystem’s natural balance. Using the data generated they hope to improve forest health and the habitat for the species that call this base home. In addition to work at Kunsan Air Base, surveys are currently being conducted at Osan Air Base in Pyeongtaek, South Korea, and at Kadena Air Base in Okinawa, Japan. The research was funded through a Department of Energy Directive Strategic Partnerships Project (SPP) with the Air Force Civil Engineer Center.